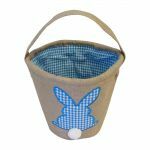 Perfect for Easter, these collapsible rustic burlap baskets are sure to bring a smile to any child's face! 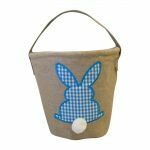 Complete with applique bunny already on the front (we've done the hard work for you! ), these look great with or without personalization. PLEASE NOTE: Collapsible basket tote does not come embroidered.